The biggest winner on TV this year was an unlikely one. Just when I thought “The Comedians” killed the autobiographical comedian show, “Master of None” came roaring in. Aziz Ansari took pieces of his personal life and made it into a show. He plays Dev, a semi-successful actor who is best known for a GoGurt commercial. Ansari has proven himself as good a writer as he is an actor and a comedian. Few shows have ever been able to handle shifts in tone this well. One episode, where Dev learns to appreciate his immigrant parents (played by Ansari’s amazing parents, who hopefully got agents out of this), could bring tears to your eyes. The episode “Indians on TV,” meanwhile, is a sharp satire on a lot of things that people think but few ever say out loud. Every episode felt like Ansari was giving us exactly what he wanted us to see. Some people might chastise “Master of None” for being yet another show about a well-off guy who is miserable for absolutely no reason. That analysis could not be more wrong. Just look at how good they make all that pasta look. 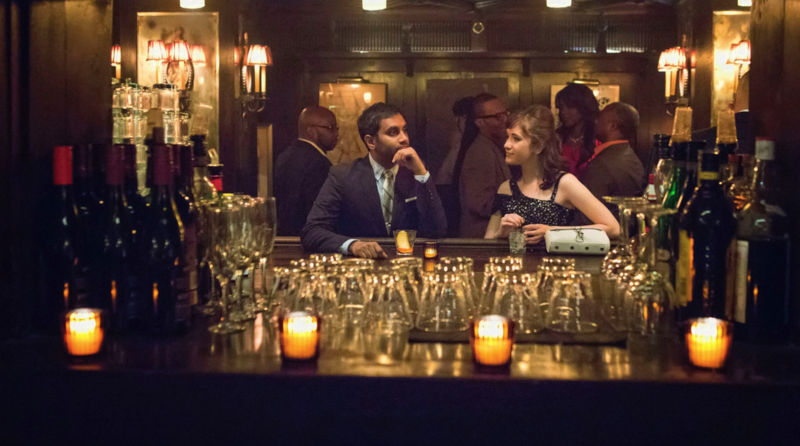 “Master of None” is a celebration of life. Now this is anthology storytelling done right (take that, “True Detective”). The second season of “Fargo” far outpaced its excellent predecessor by completely throwing its source material out the window. As fun as it was to count the Coen Brothers references (White Russian in the background! ), season two improved by going in a whole new direction. Set in the 1970s and centering on two ordinary Midwesterners who accidentally end up in the middle of a gang war, “Fargo” had an amazing amount to say about America’s heartland both past and present. At the same time, it told a breathtaking story that was both bleakly hilarious and thrilling at the same time. Season two showed us a UFO. Season three can literally go anywhere at this point, and we are all on board. In a year filled with sequels and reboots (though I could say that about every year in history), there seemed very little reason to revisit Camp Firewood. I have never been happier to be proven wrong. “First Day of Camp” is the perfect continuation to the madness of “Wet Hot American Summer.” By taking place before the events of the original movie, “First Day of Camp” turned aging into a complete joke. The show features a musical involving a “teenage” Paul Rudd getting the electric chair. Another episode gets a ton of mileage out of shofar jokes. David Wain plays an Israeli camp counselor. I could just sit here all day and list funny things about this show. “Mad Men” went out this year on its own terms. It ended not in an ad agency in New York City, but rather on a cliff overlooking the ocean in California. Don Draper (Jon Hamm), with the slightest of smiles on his face, finally finds inner peace. And in that moment of peace, he comes up with his greatest ad pitch ever, we assume. Don’s revelation is that he is, and always will be, an ad man. You can interpret that tiny smile any way you want. And discuss it for hours on end. Well done, Matthew Weiner. At times, “Silicon Valley” felt less like a comedy and more like a thriller. No episode of “Game of Thrones” this season really had me at the edge of my seat, but I can point to several “Silicon Valley” episodes that did. That is a credit to genius of Mike Judge, who can make fun of something while also making it extremely compelling. “Review” takes a one-note premise (a man reviews life experiences) to insane heights. While season one dealt with divorce and death, season two covered extortion, gloryholes, and murder in excruciatingly dark and hilarious ways. It continued to elevate Forrest MacNeil as one of TV’s greatest characters. This summer, I had the privilege of interviewing Andy Daly. Of course, he could not have been nicer, but he also laughed gleefully every time I brought up one of the show’s darkest moments. Finding comedy in that darkest moments, in a nutshell, is what makes “Review” so good. I might be biased here because my connection to “Transparent” is way too personal. I look at Judith Light running around with jars of mustard and see in that so many people that I have known in my life. “Transparent” is the most openly Jewish show ever made, and it wears it like a badge of honor. Season two continued the show’s hot streak, proving that “Transparent” was more than just “that trans show” (though it wouldn’t mind if you called it that). This is a beautiful, sometimes heartbreaking, portrait of a family. It is very specific, but also something we can all relate to. “Parks and Recreation” went out with a bang this year, pulling off what turned out to be one of the show’s best seasons. It ingeniously skipped forward to the future, which provided the show with the breath of fresh air it needed after a few years of stagnation. In terms of the show’s final episode, I could best compare it to “Six Feet Under.” If your series finale is reminiscent of the “Six Feet Under” series finale, then you did something very right. “Bojack Horseman” was my favorite show of 2014? So what gives, Ian? Why so low now? Is it because there are so many new fans now that it’s not “cool” anymore? No, because I am not in high school. Season two of Netflix’s anthropomorphic animated comedy didn’t carry the emotional punch or surprise of season one, but it was still fantastic nonetheless. Season two had some great standalone episodes, including an incredibly relevant Bill Cosby commentary. Another episode, about three different relationships, is unlike anything I have ever seen in an animated show, or any comedy in general. Best Episode: Escape from L.A.